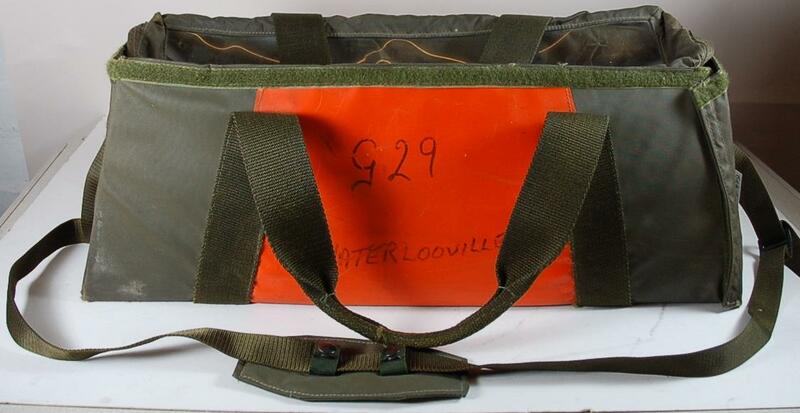 khaki bag, with two orange panels on the centre of the front and back, panels contain the words 'G29/WATERLOOVILLE.' A nylon strap handle attaches to either end of the bag, detachable via clip at proper right. The bag also has two loop handles attached to the front and back panels of the bag. The lid is hinged at the back panel and Velcro strips seal it shut. Front and back panels pull down to open the bag out and are sealed back into place with Velcro strips. Side panel proper left has a plastic window behind which is a paper note reading 'ROMSET'. Sticker on the lid, which is also of a clear plastic, reads 'OLD D O2 AND GIVEING/SET./ SUE STROUD'. Contents include one adjustable screw, one cylinder valve key and one oxygen reservoir bag.